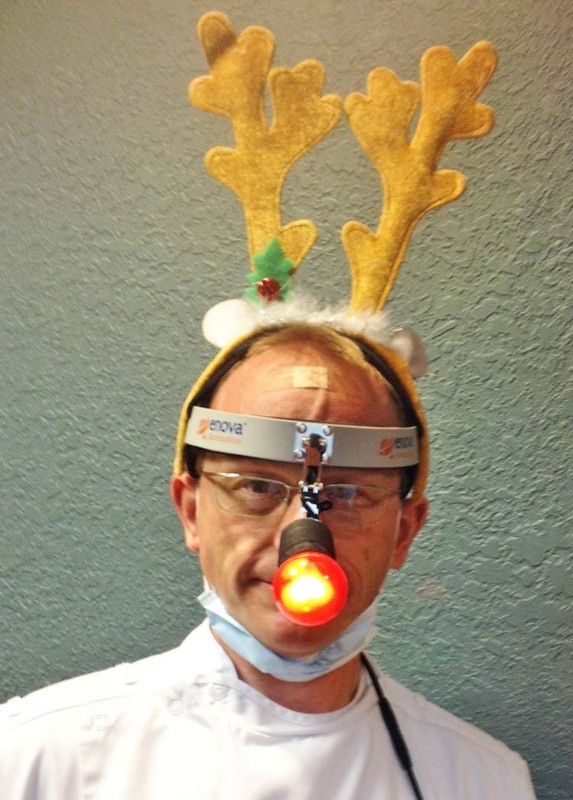 James Hamman, DDS, wearing the XLT-125 Rudolph Edition blazed the way for the holiday parade. Last week, Enova Illumination received an email from James E. Hamman, DDS, who practices in Ripon, Wisconsin. His email read, “I’m not making this up. I have been nominated to be Rudolph [the Red Nosed Reindeer] and have made a slight modification [to your headlight] for a local parade. Pray for me…” A photo accompanied the email and is shown to the left. Dr. Hamman really brought a smile to the faces in our office and we couldn’t resist featuring him in this December issue of Shedding Light! Shedding Light: Why were you playing Rudolph and what have you done to your XLT-125 LED surgical headlight? Dr. Hamman: Our dental clinic had a float in the local community holiday parade and one of the hygienists had reindeer costume headgear for each of us to wear. A very small LED was inside the hollow plastic nose, which was held in place by a simple elastic band that stretched around to the back of my head. The LED light was supposed to be actuated by tugging on the nose piece, which would obviously be a distraction to navigating a sleigh. The contraption was a bit uncomfortable due to pressure on my nose and, while it did provide an authentic nasal sounding variant of Rudolph, the battery was dead and there was no non-destructive way to fix it…and the parade was in an hour. As an inventor by nature (Dr. Hamman has three dental product patents*) I immediately saw a solution, albeit a less than conventional one. The round red nosepiece matched the diameter of my XLT-125 headlight! To be sure, the intensity of the red glow was amplified by an order of magnitude. With a little bit of black tape and creative lashing of the elastic, I secured the nose to the XLT-125 for a very glowing effect. The double articulated hinge of the headlight allowed for the light to be placed in front of my nose! And, despite a full day’s use in the clinic, and 12-degree temps outdoors, the XLT-125 Rudolph Edition blazed the way for the parade. You have to agree, there is irony in the switch up of an elf wanting to be a dentist and a dentist needing to Rudolph! Shedding Light: You mentioned your clinic participated in the parade; will you tell us a bit about your practice? 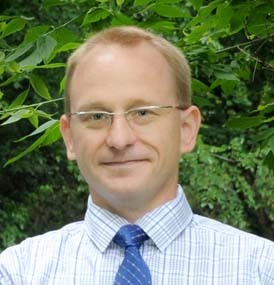 Dr. Hamman: I am an associate of Dr. Cris Johnson at Silver Creek Dentistry in Ripon and we have 12 people on staff. Our office provides all aspects of dental services including implant placement and restoration using Sirona CBCT, as well as CEREC OMNICAM CAD/CAM system. I graduated from Case Western Reserve University School of Dentistry and have been practicing dentistry since 1995. The XLT-125 color filters are a nice feature. They can be used to tune the output color and I’ve been using the 5000o Kelvin color temperature (the XLT-125 color temperature without filters is 6100o Kelvin). With Enova’s XLT-125, I can adjust the position, diameter, intensity and color range! Shedding Light: Have you used fiber optic surgical headlights? Dr. Hamman: For eight years I served as a dentist in Wisconsin correctional facilities and was working in a number of different locations. At that time, there were no LED surgical headlights and the original Halogen fiber optic systems were cumbersome and limiting in that they were tethered to a plugged in light source. Needing to remove or disconnect the headlamp between rooms was a hassle that I do not miss. I am convinced that oral surgery and all dental procedures are made easier by improved lighting. Having a lightweight coaxial adjustable focus and intensity—as the XLT-125 provides—is invaluable for any dental procedure. Shedding Light: When did you first learn about Enova? Dr. Hamman: I was researching LED surgical headlights online and found Enova’s website. That was three years ago, before the XLT-125 existed. Enova let me evaluate the Iris S-100. While the light was bright, the headlight design did not allow for adjustment of the light beam; that’s a feature I really wanted. At that time, I returned the S-100 and shared my need with Jim Nelson at Enova. So you can imagine how pleased I was when the XLT-125 came out. The XLT-125 has an adjustable aperture ranging from 2 inches to 6 inches in diameter, which lets me adjust to the exact spot size I need. It’s nice because the light doesn’t shine in a patient’s eyes and I know it is the appropriate angle and aperture when I go from patient-to-patient. Shedding Light: So, you use the headlight for examinations and surgery? Dr. Hamman: Yes. At first I only used it during surgery, but now I use it all of the time. It is very lightweight and when I use high power loupes—which can become heavy on my nose—all of the weight on my head is more evenly distributed. Most of the time, I don’t even notice that the headlight is there. The XLT-125 is a very good LED surgical headlight; I can trust the field is always illuminated. Using both an overhead dental light and the XLT-125 provides redundancy of light source that minimizes shadows. Shedding Light: What do you think of the battery pack? How often do you charge the headlight battery? Dr. Hamman: The digital battery case design is very intuitive and well-thought out. Its touch pad is easy to actuate even under protective clothing. The battery life is significant and I charge the battery daily as a matter of routine. When I headed out to the holiday parade with my headlight after a full day of use, I was curious how the temperature would affect the battery. It was very cold—around 12 degrees—and the headlight glowed brightly throughout the parade. The battery longevity, even in low temperature, is phenomenal. Dr. Hamman: The XLT-125 comes with color filters and those are a nice feature. It is possible to tune the output color with them and I’ve been using the 5000o Kelvin color temperature (the XLT-125 color temperature without filters is 6100o Kelvin). But, as I’ve stated earlier, I wanted an LED surgical headlight with an adjustable light beam. With Enova’s XLT-125, I can adjust the position, diameter, intensity and color range! I’m impressed with the headlight, but I’m also impressed with Enova. They listened to what I had to say about improving their headlight. It warms my heart that they embodied it and built it locally. *One of Dr. Hamman’s patented inventions is Safears®, which makes HVE tips quieter. Learn more by watching this video: https://www.youtube.com/watch?v=hT7kECq-o0s. Visit Enova Illumination’s YouTube Channel!